← Why has there been a rapid increase in heat-related extremes in Western Europe since the mid-1990s? It’s commonly known that burning fossil fuels, like in jet engines, leads to the emission of carbon dioxide (CO2) which causes global warming. It is perhaps less well known that, particularly in the case of aviation, carbon dioxide is not the only (nor necessarily the smallest) problem. When it comes to determining its climate impact, the aviation sector is complicated, with an entire range of ‘non-CO2’ impacts to consider. Burning jet fuel also releases water vapour, another greenhouse gas, as well as oxides of nitrogen which leads to changes in ozone and methane, two other greenhouse gases. In addition, aircraft cruising at high altitude through very cold and moist air form long-lasting contrails. 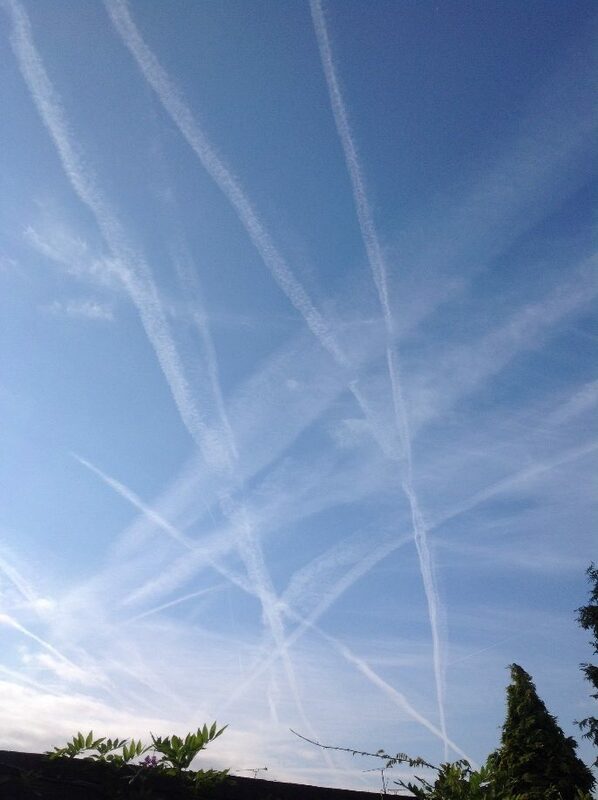 These long-lived contrails have potentially as large a climate impact as that from aviation CO2 emissions (Reference 1). Figure 1. Long-lived contrail cirrus criss-crossing the morning sky over Reading. How can we continue to fly, but with a smaller impact on climate? It is encouraging to note that not only are there many possibilities being investigated, but some are already being introduced. There is gradual technological development which brings, for example, more fuel-efficient aircraft engines. There is development of cleaner aviation fuels which are not petroleum-based (although at present the alternative fuels certified for use have to be blended 50:50 in combination with the traditional kerosene). Improvements to the way air traffic is managed may also play a role. It is in this latter category that climate-optimised aircraft routing falls. Traditionally, aircraft routes are optimised by factors such as operating cost, fuel use and flight time. A new idea, investigated under the European project REACT4C (Reference 2), was to find the optimal route which minimised the impact of that flight on climate, where the climate impact included not only the CO2 emissions (i.e. fuel burn) but also the non-CO2 impacts. This approach, whilst having the advantage of not requiring any developments to aircraft technology or different air traffic control procedures, is made non-trivial by the non-CO2 impacts. Just the detailed computations of the impact of emissions from one day of trans-Atlantic flights required huge computational effort, since some of the emissions have a long lifetime and their impact depends on not just where they are emitted but where the emissions are transported to and the chemical processes they undergo during their lifetime. An additional complexity of the project, which was also one of its greatest strengths, was the involvement of scientists and engineers across a range of disciplines, from atmospheric and climate modelling to aeronautical engineers and air traffic control experts from six different countries. Establishing a common scientific language across disciplines can sometimes be a challenge – for example meteorologists are very attached to pressure as an indicator of altitude, whilst engineers and air traffic control specialists use flight levels in thousands of feet (which despite their units are really pressure levels in disguise). However in the end the project benefits from the individual expertise of each of its members, and ensured greater applicability of the results to the aviation industry. The study simulated the full set of trans-Atlantic flights on each of 5 days with different weather conditions (in terms of their upper-level winds). By varying the flight path of each flight, we were able to find safe combinations of flights through north Atlantic airspace which, if their total climate impact was calculated, had a smaller climate impact than the set of flights with smallest economic cost. One of the headline results from the project was that it should be possible to achieve a 10% reduction in total aviation climate impact with a 1% increase in economic cost (Reference 2). Any cost increase may be unpalatable to an industry run on tight margins, but the study also showed that this cost increase could be compensated for by incentivising climate-optimised routing through market-based measures. Our current research, under the umbrella of the Single European Sky Air Traffic Management Research (SESAR) (Reference 3), seeks to apply this idea to the more congested airspace over Europe. This entry was posted in Atmospheric chemistry, aviation, Climate, Weather, Weather forecasting and tagged contrails. Bookmark the permalink.